Pizza stones, or safe ceramic tiles, are ideal for baking pizzas and rustic breads on as they mimic the traditional method of baking in a stone hearth or fire brick pizza oven. The hot stone quickly crisps the underside of the dough without overcooking the toppings or top-side of the dough. If the stone is not clean or the dough is particularly gooey, however, the item being baked can stick. A few tricks can help prevent items from sticking or loosen them up if already stuck. Keep the stone clean. Blackened pieces of leftover pizza or bread crust can stick to the stone and cause the next item for baking to adhere directly to the charred pieces, thus “sticking” to the stone. Keeping your stones clean with thorough dusting after each use and water washing if necessary is the best way to prevent items from sticking to the stone. Use plenty of dusting flour on your dough or pastry. Before placing directly on the stone, dust the outside of your pizza crust, bread loaf, or other dough-based item that you are baking directly on the stone with sufficient amounts of flour or cornmeal. The dry flour or meal should act as a barrier between the stone and moist dough. Preheat and bake at the correct temperature. Always preheat the stone for at least 20 to 30 minutes before baking. Pizzas should enter the oven between 475 and 500 degrees Fahrenheit. For breads, use the designated temperature for your recipe. Use a pizza peel, the long wooden paddle used to put the pizza in the oven and take it out, to get the pizza onto the hot stone. If you don't have one, use a large place mat, cutting board or spatulas, or remove the stone from the oven with heavy potholders and slide the pizza off of the counter onto it. Line the stone with parchment paper. Lining a pizza stone is generally not recommended for "authentic" pizza. However, if you are baking something greasy like cookies or cheese rolls, lining the stone with parchment can be beneficial. If your dough continually sticks to the stone even when clean and the dough is dusted with flour, place a piece of parchment between the stone and pizza. 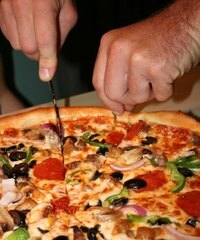 Slide dental floss under the pizza, bread or baked good in order to loosen it. If the pizza or other item does end up stuck to the stone, loosen it by running dental floss under the entire length of the pizza. The floss will break any burnt pieces holding it down. When sliding the pizza from the counter onto the hot stone, ask a partner to help you. One person will hold the hot stone with two hands and the other will slide the finished pizza. For safety reasons, do not try to hold the stone with one hand and slide the pizza onto it with your other hand.